Barb's Bike Shop has been in business since 1989 - learn more about us here. We carry a wide variety of road/mountain bike accessories, clothing and safety equipment. Our showroom is also fully stocked with all types of bicycles of from Jamis, Schwinn and GT. Don't forget to check out our Rail Trail jerseys on the shop page! We recycle tires and tubes through Resource Revival. Barbs has experienced bike technicians who can handle almost any repair issue. From flats to tune-ups to complete overhauls, we do it all. As a matter of course, we'll always give you an estimate before beginning work on your bicycle. As of Spring 2019, Phase II of the Dennis-Yarmouth Cape Cod Rail Trail expansion has been completed. The Bass River bike bridge is in place, & both its connecting paved trail sections are open to the public. This means that cyclists can now ride nonstop from Route 134 in South Dennis heading west to all the way to Station Ave. in South Yarmouth. Phase III is scheduled to begin during late 2019. Read more about the project here. Click on the image to your left to visit our Cape Cod Rail Trail photo gallery. 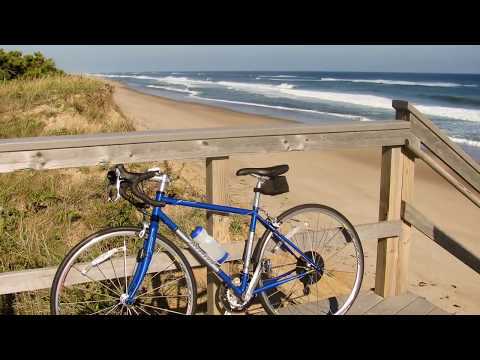 It features a montage of beautiful scenery from along the bike path from Dennis to Wellfleet. This is just a taste of the breathtaking natural landscapes you'll experience on a ride along the Rail Trail. Have a good experience? Post a review on Yelp by clicking the link below to leave feedback. We deeply appreciate your business and hope to see you again next summer! Spend your day riding, not driving - print out our rental reservation contract HERE before you arrive at the shop! We offer a single speed weekly rental at the low price of $60.00! Please mention website ad for special pricing. Come in to give them a test ride and take one home for the week. Access three bike trails from our conveniently located shop: the Cape Cod Rail Trail, Chatham Old Colony spur and Nickerson State Park paved system. We have over 400 bikes to choose from, and no reservations are needed for groups under 15 people. Free helmets with all rentals. And we’re the only shop that charges AFTER your ride in 30-minute increments. We also offer free delivery and pickup within our local area!